Our escape room Valentines promo this year has been inspired by space. The late great Carl Sagan said, “The earth is a small stage in a vast cosmic arena.” He also said the vastness is bearable only through love. How right he was! The Voyager 1 space probe picked up an extraordinary image as it made its exit from our solar system into deep space. At the prompting of noted astrophysicist Carl Sagan, NASA turned the camera backward for a portrait of our little corner of the universe.¹ The image it captured on February 14th, 1990, which Sagan named “The Pale Blue Dot”, has become almost as famous as the scientist himself. 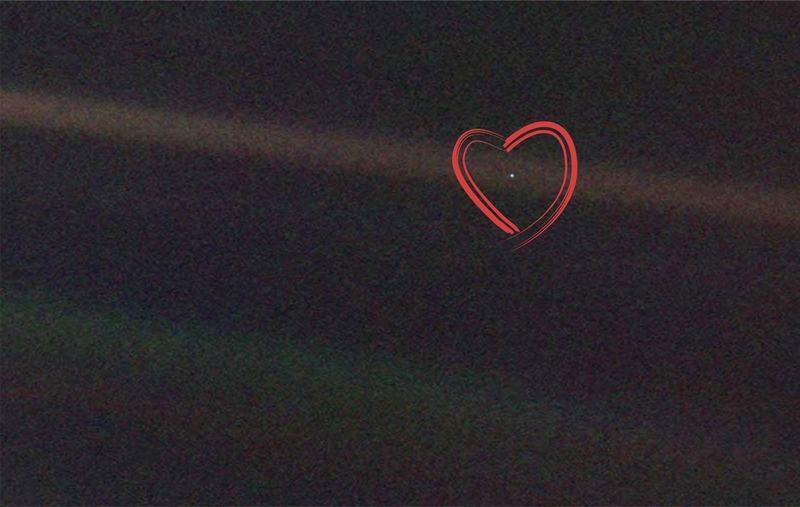 Voyager 1 snapped this grainy picture of planet Earth from a distance of approximately 4 billion miles! Indeed, it paints a poignant picture of our smallness, but not necessarily our insignificance. The camera’s lens created a sunbeam effect that suffuses our pale blue dot in light. This planet, this moment, this spotlight… on the international day of love. Simply put, it depends on your perspective. People often speak of giving a ‘shout out to the universe.’ But do we stop to consider that Someone out there in the universe answered back? What’s more, might it be that this Someone looks on our little speck of dust not only benevolently, but lovingly? Like an artist looks at their work. Like a parent looks at their child. Or like a lover looks at their beloved. At ConTRAPtions Escape Rooms, we tend to notice the romance the Maker of the universe scripted in the skies. Additionally, we’d like to thank Dr. Sagan for encouraging NASA to take this amazing picture. To celebrate love, creation, and space (let’s face it, space is undeniably cool), we are running our 2019 escape room Valentines promo. For the month of February, book with us and come to your game dressed in a costume that matches the escape room you’re playing. We’ll give you a retroactive 15% discount off your booking! Rules: don’t skimp on the creativity, now. You can’t just throw on a tie and say “I’m a secret agent!” Nope. We want the works.